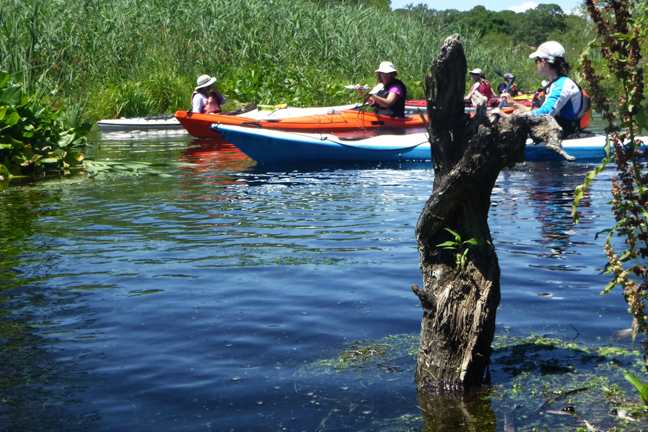 More than 20 NACK paddlers enjoyed fine weather and abundant wildlife last weekend paddling the tranquil Carmans River. The river flows through the Wertheim National Wildlife Refuge in Brookhaven and we traveled from the cold, spring fed water near the falls all the way to Bellport Bay. The river, and its small tributaries, are fed by fresh water springs and the water at the north end is noticeably colder than the salty lower reaches towards the bay. 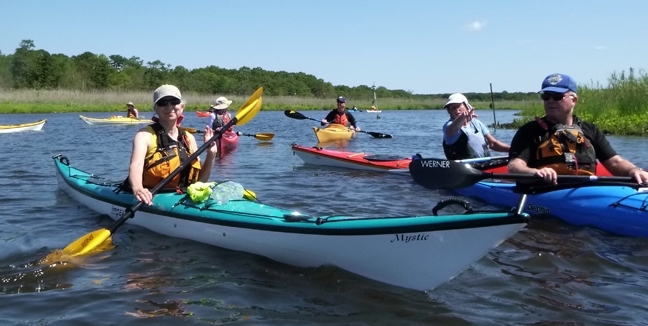 As we paddled we found waters teeming with juvenile menhaden, a small to medium sized fish that’s a member of the herring family. Hundreds of fish were clearly visible in the crystal clear water beneath our kayaks. We found schools so dense that they sometimes would swim right up on shore much to the delight of feeding shorebirds. During our leisurely 8 mile trip great blue herons and egrets flew majestically over head while an occasional cormorant would dive and swim for what seemed like minutes at a time in search of a meal. A group of Canada geese stood their ground warily on the shoreline as we passed, keeping our distance so as not to disturb the newly born members of the flock or their parents. In the distance an Osprey pair sat, perched on their huge nest high in a towering tree, surveying their domain. Perhaps the most interesting moment came when we spotted a young born fawn bedded down in the marsh grass along the shoreline. The youngster didn’t seem the least bit bothered as our kayaks silently glided past it’s hiding spot. After a brief lunch stop at Indian Landing we continued south out to mouth where it meets Bellport Bay. In the distance stood the shimmering image of the Fire Island National Seashore across the bay. 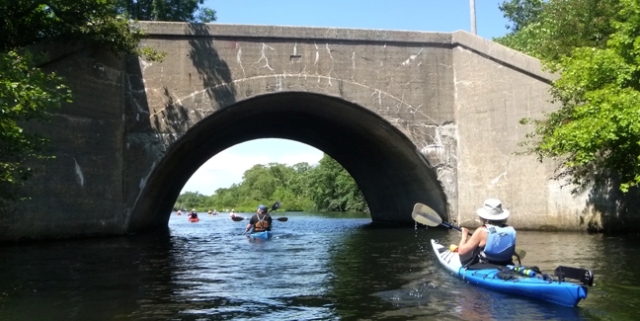 But that’s a destination for another day…..
Here’s what one paddler had to say about the trip. A picture perfect day. Being with a great group of people, practicing skills, the exercise…but what I remember most is taking in the scenery. Littled painted boats gliding and sculpting through inlets bordered by tall wispy grasses and dotted by white egrets. The water clear and shallow, the abounding shades of green, the temperate breeze. Thanks for a great trip! Gorgeous photos and excellent commentary! Thanks very much, I really enjoyed the coverage. An absolutely wonderful story and super photo’s. I feel like I was on the trip. Thanks.